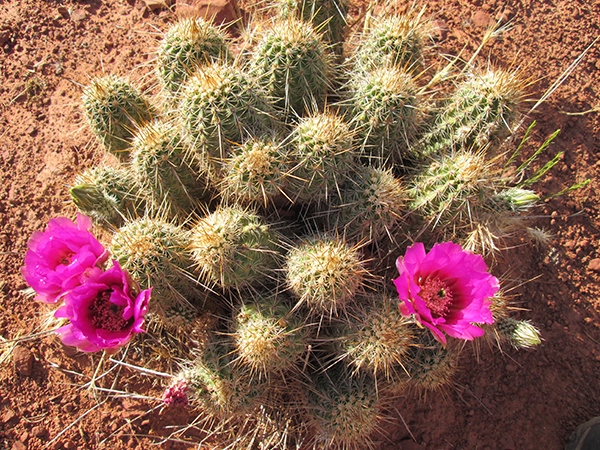 These hedgehog cactus should have been done blooming a long time ago. They’re torturing me, because my person won’t stop taking pictures of them. Why don’t they just go away? I keep thinking they’re gone and then some more of this colorful stuff pops up on my trails. C’mon person. 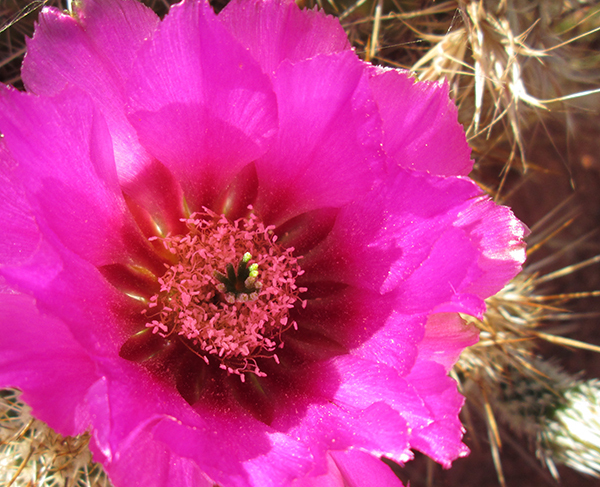 Haven’t you taken enough pictures of these cacti? I’m taking you home now. You’re going to wear out your camera. Hey person, what are you doing? You’ve got to stop wandering off like that. Oh no, look at this! …that she’s started taking pictures of ants. Person, wouldn’t it have made more sense to wait until you had that ant in full view before you took the picture of it? Patience Bongo my darling… there is an artist at work! 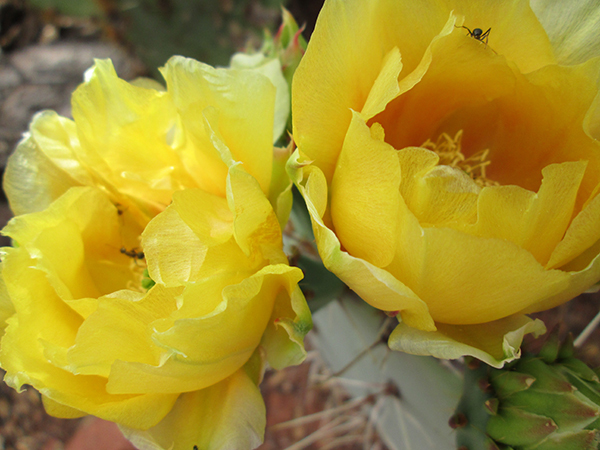 you must admit that the flowers are very pretty and even the ant had his party hat on…didn, t you notice that? Patrecia, those ants are pretty good at partying, but they don’t play fair – they bite – so I don’t party with them. They must have seen your Mum coming with her camera and wanted to get on your blog. 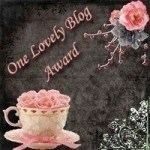 Basically, Bongo, the flowers are also taking over your blog, eek! Pigs, it seems like everybody is stealing my blog lately. Lily & Edward, sometimes my person gets too close while she’s taking pictures and she gets some souvenirs stuck in her leg. She’s just not listening to you, B. I would like to say to get right in there so you’re in the picture, but I’m afraid the cactus will pinch you. Don’t get pinched! 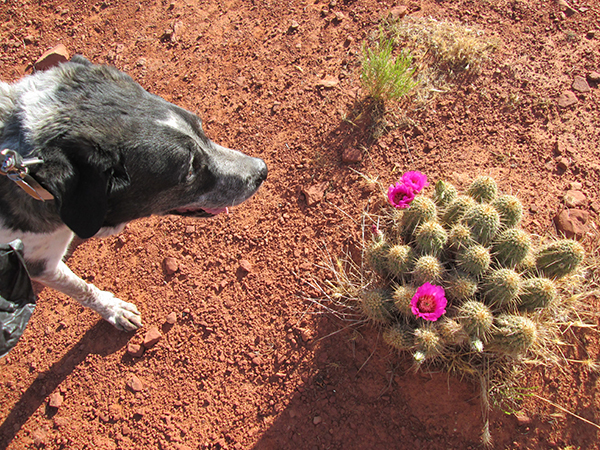 Cupcake, maybe I could distract my person so she turns and clicks her camera at me instead of those prickly flowers. Ants? Really? Oh dear…. you have got to do something about that Bongo. I’m not sure what though. Maybe you need a thinking cap as well as your detective hat. Firebonnet, those ants think the own the place this time of year. So far they’re not in my house so I just might have to take my person back home. Bongo, I think you are right, she is obsessed but on the other hand, look at that, they are everywhere… get your face in front of the camera!!! I like that last one with the ant peeking his little head! Marina, I’ve been trying to photobomb the pictures but then my person just takes more of them. Kevin, I’ll be patient just for you. Because you’re my friend. I guess the flowers where you live must be very different than ours. Fredrieka, I’ll do anything for you. Perhaps you should try wearing the flowers so that she’ll take more photos of you?! Dalton, I tried that once but they tickled. Maybe I should try a different kind of flower. Daydreamer, I have a few funny hats, but I think I might have to get a new one. My person would have to take my picture then.